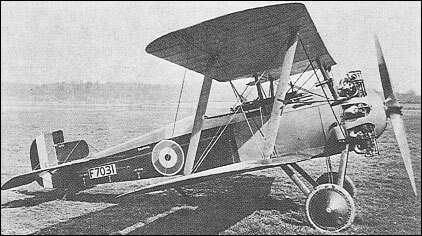 Designed in parallel with the Snark triplane and similarly intended to meet the requirements of the RAF's Type I specification, the Snapper single-bay staggered equi-span biplane was destined to be the last fighter to bear the Sopwith name before the company went into liquidation in September 1920. Three prototypes of the Snapper were ordered on 6 June 1918, and, although originally designed with a plywood monocoque fuselage, all three aircraft were completed with conventional fabric-covered fuselages. Powered by a 320hp A.B.C. Dragonfly I nine-cylinder radial engine and carrying the standard pair of synchronised 7.7mm machine guns, the first Snapper performed manufacturer's trials in the second half of July 1919, being delivered to Martlesham Heath for official trials on 1 August. Flight test was somewhat spasmodic owing to recurring difficulties with the engine, but all three Snappers were at the RAE, Farnborough, in mid-1920. It is presumed that trials continued until the decision was taken to discontinue further attempts to rectify the engine's problems.